Mike was a historical advisor to Ubisoft for their video-game Assassin’s Creed IV: Black Flag. He not only advised on hand weapons and fighting styles but also the disbursement of cannon in order to keep the ship balanced. He was involved with nearly every department, commenting on pirate culture in general and discussing many details from accents to drinking. 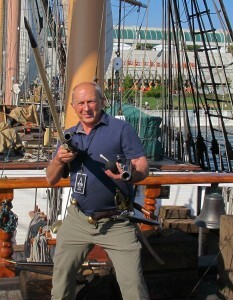 He has sailed on large sailing ships and understands the problems of hand-to-hand combat in a confined space and on a rolling deck and he is experienced with a wide arsenal of pirate weapons, including muskets, pistols, blunderbuss, boarding pike, boarding axe, cutlass, knife and grenade. Pirates carried an elaborate range of weapons because each stage of a boarding action required a different weapon for a particular purpose. For a television film about pirates (The True Story of The Pirates of the Caribbean – Channel 5), he test shot naval canon with round shot, bar shot, chain shot and cutlery. Mike gave a series of live lectures about pirates, pirate culture and fighting methods, at ComicCon in San Diego and in Genoa, Italy as part of the launch campaign for Assassin’s Creed IV: Black Flag.